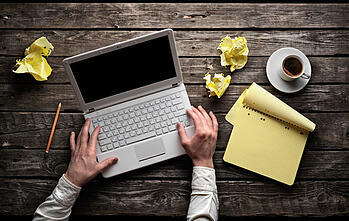 As a blog contributor and a copywriter, nothing is more intimidating than staring at a blank page. But let's get real for a second; starting anything can be terrifying. From learning to ride a bike to starting a new job... Once you get acquainted, you'll feel more comfortable and natural with whatever obstacle you're trying to overcome. But when you're at the starting line, how do you get started in the first place? How do you get to the moment where you can "let go of the handlebars" and start mastering the task at hand? In today's post we are going to help you get started, in 5 easy steps! Everything you do begins at the 'starting line'. One way to overcome the intimidating blank page is to start with a checklist; this will help you to stay productive and set your blog up for success. Start by picking out a blogging service: HubSpot, WordPress, Blogger are a couple of great places to get started and keep your blogs organized. Set business blogging goals! According to HubSpot, "blog frequency impacts customer acquisition. 92% of companies who blogged multiple times a day acquired a customer through their blog." With that in mind, blogging is clearly a great way to increase traffic and conversions, but what is the intention behind your blog? Are you looking to become a thought-leader? Are you looking to be a resource? Whatever your goal may be, be sure you have established one before you start blogging. These two steps are going to take your blog from 0-60; but what's next? Let's say you're an inbound marketing agency (like us) and you're mapping out your blog topics and keywords. How do you decide what you're going to write about? You're going to write about topics that your buyer personas are going to be looking for. If you're an inbound marketing agency you'll want to cover topics like: 5 Lead Generation Tips for Beginners or How to Avoid Common Email Marketing Mistakes. These topics are going to help your personas to improve their marketing and ultimately, their business. When you start producing content that solves a problem instead of promoting your brand, you'll be one step closer to a starting successful blog for your business. But before you hop off this blog post and take a deep dive into blogging, you'll need to be sure that your content is SEO ready. Yes, we are talking about keywords. Once you have conducted your keyword research and strategy, you can then determine what keywords align with each of your buyer personas. What are they interested in? What problems might they be facing? The answers to these questions are going to help you rank higher on their search, which will increase your blog visibility. See, it's a win-win for you and your persona. From your New Year's resolutions to organizing your workspace, everything is better when it's consistent! And the same rings true for your business blog. Keeping your blog consistent and relevant with not only your posts, but the tone of voice and style will increase traffic overtime and keep your readers loyal to your blog. For example, if your blog is all over the place and you haven't established a "voice," your audience won't have the opportunity to connect with your blog and your business. No connection = an increase in unsubscribers. Get every one of your blog contributors on the same page, establish a voice and start blogging at least once every business day to become and stay successful. 1. Share with your team: One of the best ways to develop a blog that is successful is to invite other members of your team to contribute to your blog. From your interns to your CEO; everyone is going to offer a new perspective. In order to keep everything organized, develop a spreadsheet and enter all of your blog topics, keywords, assigned authors and due dates. 2. Share your content on social: In order to increase your visibility you need to be promoting your blog content on your social media channels. LinkedIn, Twitter and Facebook are a few great places your personas are most likely exploring, so use this to your advantage. Don't forget to use relevant hashtags and encourage engagement with an open-ended statement. #5 Is Your Blog "Blog Ready"? First off, are you addressing the needs of your audience? Yes? Okay, next. Have you included a relevant call-to-action (CTA) at the bottom of your blog post? This is the perfect opportunity to increase your conversion rate and drive your audience to take action. Wondering why we are suggesting a CTA at the bottom of your blog post? Answer: so you don't drive your audience away from the content that you took the time to develop! Next, is your blog post easy on the eyes? Include bullets or numbered lists when possible and break up your content so it doesn't look cluttered. After all, you want your readers to have a good experience while visiting your business blog, not feel like its "work" every time they land on your page.